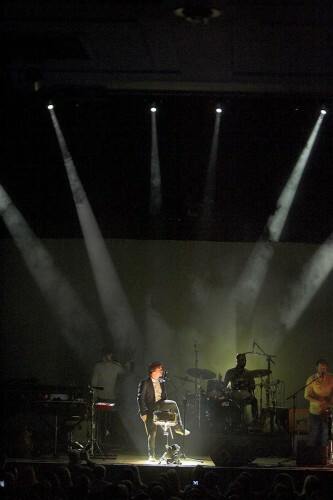 UK - Mood, drama, invention and Robe moving lights were at the heart of the elegant, intricate lighting design created by Rich George from 3DL&S for jazz-pop singer and songwriter Jamie Cullum’s Momentum tour, which has just completed its first UK leg and now heads to Europe. 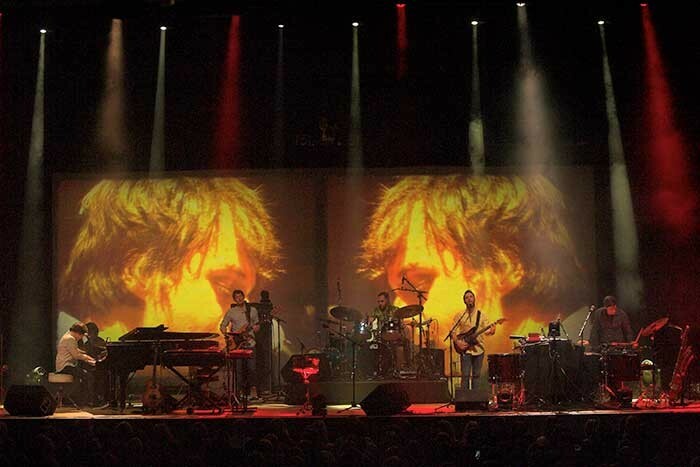 George is based in London and this is his second tour with Cullum and his first as LD, where he works very closely with Cullum’s artistic and visuals director Nickin Corrigan to produce the captivating live performance aesthetic. This is based around creative, quirky and highly effective use of IMAG camera footage which was George’s starting point for the lighting design. The lighting equipment is supplied by Leeds-based rental company Zig Zag Lighting which has serviced Cullum’s live work for some time. His tours have also incorporated Robe products for a while. For ‘Momentum’, the lighting design includes the latest Robe Pointes and LEDBeam 100s, together with LEDWash 600s and Robin 600E Spots. The fixtures are arranged across two trusses, front and back, and the floor. On the front truss are six LEDWashes used to light the faces of Cullum and his band. Cullum’s key lighting is combined with a soft focused followspot; he has multiple stage positions and will get up from the piano with little warning. The soft focus means the spotlight is almost unnoticeable and looks like a continuation of the front wash.
On the back truss are six Robin 600E Spots and six LEDBeam 100s, the latter fitted with top hats to reduce some of the spill and tighten up the beams, which look especially good in the water-based haze they are using. The four Pointes are also on the back truss together with some 2-lite Moles. Dotted around on the floor are five more Robin 600E Spots and additional 2-lite Moles. The 600E Spots provide back-lighting for each band member while the Moles produce a general stage glow effect. Both sets of lights are arranged in a semi-circle to shape the stage. Also on the floor are another three LEDBeam 100s, two up-lighting the floor toms and one on Cullum’s snare drum which gets struck mid-way through the show. George operates using an Avolites Tiger Touch console. Lighting and camera footage blend seamlessly and beautifully to reinforce Cullum’s intense and highly entertaining performance which is enthralling sold out audiences everywhere they play. George has used Robe technology in his work for some time. He was first ‘bitten by the brand’ back in 2006/07 when the Digital Spot range was launched and Robe has now firmly become his moving light brand of choice. However, this was the first time that he has used Pointes in a design, with which he is suitably impressed. “Powerful, versatile, fast and bright,” he comments. In a couple of numbers they are used to dapple the stage with white light as well as for other texturing and movement effects. He also makes the most of the six-facet linear prism which is proving to be a great ‘filler’ effect for several songs. He remarks that you can get a considerable amount of movement using this without having to move the actual lamp head. There is also a spectacular look where the Pointes all focus on the piano and bounce off a mirror on the lid for the end of ‘Don’t Stop The Music’. The Robin 600E Spots were the real work-horses of the show, appearing in almost every song, used for a multiplicity of tasks including top and back lighting, numerous gobo scenes and dot-breakup looks. George particularly likes the primary red, either mixed or on the wheel, in the 600E Spots. The LEDWashes are used for what they were designed to do to wash the stage in clean even bands of colour and their fast movement is appreciated. The live show had a pool of potential numbers but no set list keeping George and everyone else involved on their toes, and in the spirit of improvisation and spontaneity. It is full of powerful, simple and direct lighting looks that complement and contrast the video, all collaborating to produce a unique, intimate look and feel just as if Cullum was performing in a small, smoky, speakeasy environment and virtually on a one-one with every member of the audience. Audio for the tour is provided by south London based Chaps PA company. FOH is engineered by Danny White with John Underhay on monitors.